Okay, enough with all the pho. I think it’s time for folks to try some other Vietnamese dishes. There are hundreds of snacks and soups, both in Vietnam proper and in Little Saigons around the world, but for reasons I’m still trying to understand, both restaurateurs and diners settle into predictable menus. Savory bits of shrimp, mung beans and scallion oil top little steamed rice cakes. Vietnamese cuisine today is where Chinese food was in the 50s, though some decade soon I’m sure restaurants will begin expanding beyond summer rolls, spring rolls, shaking beef and sizzling/happy/singing crepes. Perhaps it will be when we let go of the Western kitchen’s saute line, or when the rubber plantation decor finally goes the way of the tiki room, or when tourists from Vietnam can visit here as readily as we fly there. Until then, I’d like to encourage you to try two of my favorite hot-weather dishes. Now that you’re familiar with rice noodles in broth, go enjoy a plate of banh cuon and banh beo. Vietnamese cooks coax rice grains into endless shapes and textures, and these two dishes are classic ways to enjoy the cuisine’s distinctive layering of flavors. The best banh cuon are made to order. The set-up is simple: thin fabric stretched over the mouth of a wide pot, a few inches of simmering water, an oiled surface for rolling. A flat ladle and a long wooden stick are the only gadgets you need. Unfortunately, the skill required to coax a thin rice batter into a transparent round of edible silk must be passed from generation to generation. Wrapping savory fillings, such as pork or mushroom, is the most common way to use the steamed rice sheets, though other versions have ingredients sprinkled above plain rolls rather than wrapped within them. Fresh herbs, like young mint leaves, and fried shallots should appear somewhere nearby. Just before you eat the rice rolls, you’ll flood them with a dilute version of that ubiquitous dipping sauce made from nuoc mam. 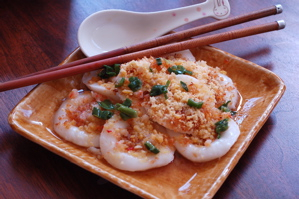 If you steam rice batter in tiny dishes rather than on a thin layer of fabric, then you’ll have piles of cute banh beo. Something magical happens in the steamer to create a dimple in each round, perfect for holding bits of flavorful ingredients. The classic toppings are delicate in texture while concentrated in taste: dried shrimp cooked to neon orange, mung beans ground to golden fluffiness, perfect dice of crisp pork rind, or scallions wilted just until sweet. The same thin sauce flavors these lovely dimpled rice cakes. My fleet of dipping bowls â€“ only 39 cents each at Kamei on Clement â€“ serve double duty as molds for banh beo. 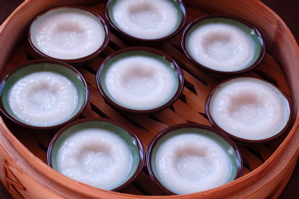 Here’s the easiest way to eat banh beo: use chopsticks to nudge each round onto a soup spoon, make sure there’s a representative amount of sauce and topping included, and then slurp the generous mouthful in one, happy bite. If you live in Oakland, you’re not far from a restaurant that serves both banh cuon and banh beo. If you want to learn how to work with rice batters and how to make banh beo in your own kitchen (so easy!) then join cookbook author Andrea Nguyen and yours truly for a special hands-on cooking class. It’s a weekend class sponsored by Slow Food at Terry Paulding’s amazing teaching kitchen in Emeryville. In this class, we’ll also teach you how to work with dried rice paper and how to make truly crisp banh xeo. Vietnamese salads, sweets, beer, and salty plum limeade round out the menu. Slow Food members $50/nonmembers $60. Andrea has a detailed flyer (pdf) at her website. You can also contact Frankie Whitman at fwhitman at pacbell.net for more information or to register.